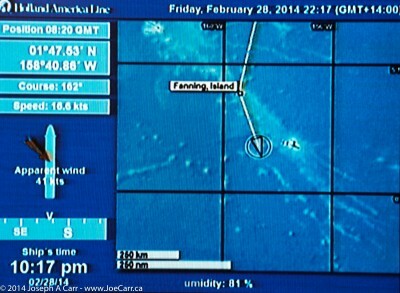 We arrive at Fanning Island at 7:30AM. 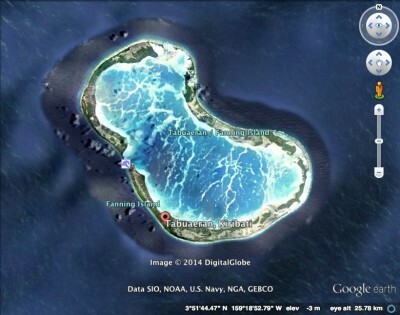 It is 26℃ (79℉), 84% humidity, and a Sea Depth of 2,460 metres just outside the entrance to the atoll. Obviously the ship won’t be anchoring; instead it holds position with engines running until we leave at 2PM. This illustrates just how steep the fall-off is from the shores of this island atoll. The tendering is slow, with a couple of hundred people waiting at any one time from the 8AM start. I wait until mid-morning and then go downstairs to get a tendering ticket. I’m in the tender and on my way within a half hour. It is a long 25-minute tender ride to the tendering dock. The area around the dock is crowded with islanders hawking shell necklaces, singing kids wanting dollar bills to help buy school supplies, and islanders dressed in strange costumes of coconut husk armour (again wanting a dollar or two donation for a photo). There are also a few trucks with seats in the back that take passengers on a drive around the island for $10. The day is beautiful and sunny, but the seas are a bit choppy outside the lagoon. I’m glad I went ashore, even though I returned an hour later after a walk-around. Living conditions are certainly third world. There is debris all over the island, since the islanders seem to have no plan to manage their garbage. They have no running water, collecting rainwater for drinking, dump their sewage in the lagoon, and have no electricity (other than what a few solar panels provide to individual families who can afford them). I don’t see any satellite dishes for TV reception, although there is a radio tower on the island, so I assume they can use radio to communicate with the outside world when needed. The islanders seem happy, but this place appears to have little going for it. Holland America ships call a half dozen times a year, but otherwise there is no tourism. The islanders fish the lagoon to feed their families, and harvest seaweed for export. Cargo ships must call, since they have canned food, staples, and fuel to run a few trucks and motorcycles on the island. The ship sails from Fanning Island a bit after 2PM, so it is more-or-less on time, although I don’t think it matters much since our next port-of-call is Bora Bora, where we have an overnight stay before moving on. It will take us two days to get there, and the captain says we have to average 18 knots. There is no bad weather forecast, so we should arrive on time. I have a shore excursion booked for Bora Bora – a Beach Break and Snorkel at a nearby motu, which should be fun. For the first time on this cruise we have a strong wind to contend with. 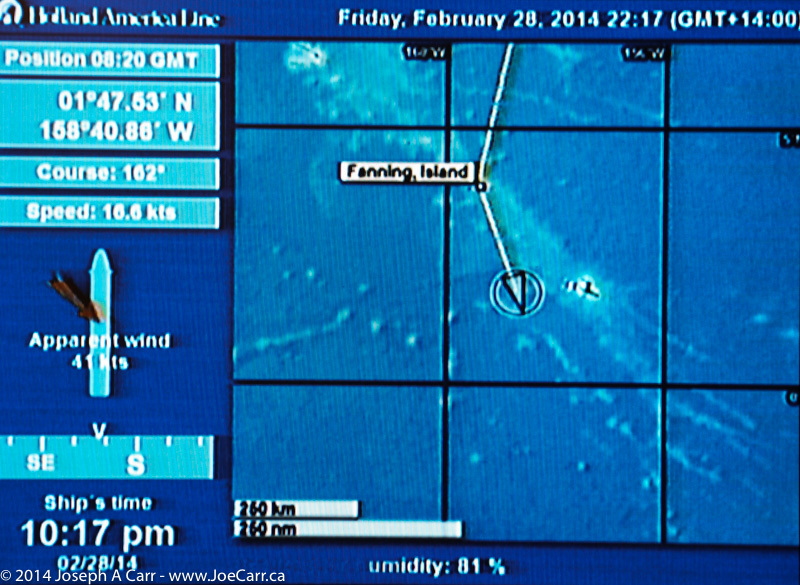 We are currently steering a SE course, and we have a 40-knot easterly wind buffeting the ship. I have to give up my star gazing from Deck 14 Sky Deck because I am being literally blown off my feet! Needless to say, holding binoculars still to observe with is virtually impossible, despite having a Plexiglas shield surrounding this deck forward.